Political Parties, Organisations and Associations often have a need to survey their members to discover their opinion, to indicate which way they may vote at an upcoming election, or simply to take a survey, such as a customer satisfaction survey. 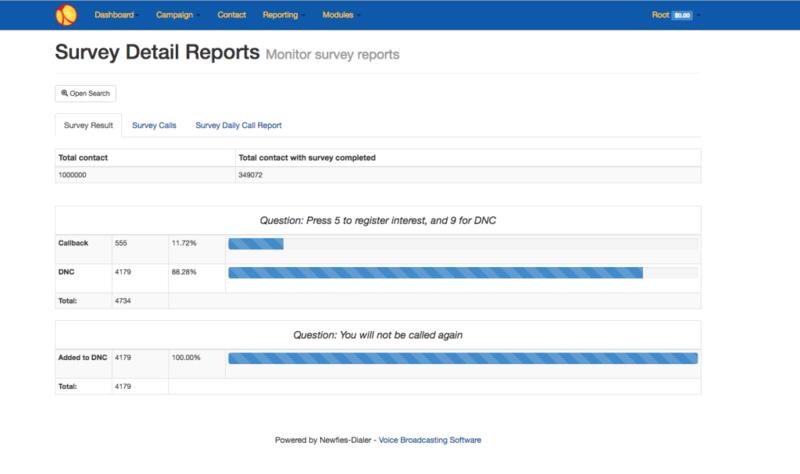 Surveys are supported by Newfies-Dialer as standard, and can be as simple or as complex as needed. A survey is made up of nodes, there are different nodes for different functions from multi-choice node, recording, sending SMS and others. Once the survey is built, then telephone numbers can be uploaded, and a campaign created with the survey and the uploaded list of numbers to call. The campaign is then launched, it can be monitored in real time, and the aggregate results are shown on a graph on Newfies-Dialer. A detailed report can be downloaded showing the results of each call. Newfies-Dialer gives the ability to phone poll large numbers of people and then present an outbound IVR menu which can present a number of questions to the called party, and by using the keypad, can indicate their preferences, or take part in a telephone survey. The results can then be recorded and used for later analysis. Questions can be recorded using professional voice talent, or a text to speech application can be used. We currently support a range of TTS providers and languages.